Minister for Finance Michael Noonan (left) and Chief Executive of the NTMA, John Corrigan, will be pleased at the outcome of this morning's auction. IRELAND HAS RETURNED to the bond markets today for only the third time since entering an EU-IMF bailout – raising €500 million through the sale of short-term bonds. The National Treasury Management Agency said the auction had resulted in it paying a ‘yield’ (or interest rate) of 0.70 per cent. That interest rate is down significantly on the yield paid after a similar auction two months ago, when investors demanded an average interest rate of 1.8 per cent. 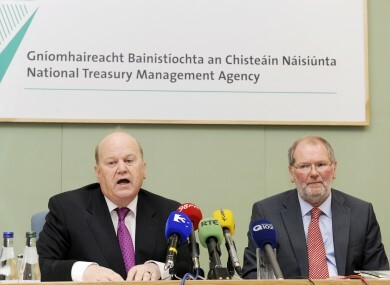 The NTMA said demand for the short-term bonds, known as ‘treasury bills’, was 3.03 times the amount on offer. Finance minister Michael Noonan said the result “once again highlights the improvement in market sentiment towards Ireland”. “It is clear that the markets are reacting very positively to the June 29th commitment [of Eurozone leaders to split Ireland's bank and sovereign debts] and positive developments in Europe,” he said. The prospects of a more favourite rate took a boost yesterday when the price of borrowing on the second-hand markets came down after Germany’s top court rejected a challenge to the Eurozone’s new permanent bailout fund. The cost of a one-year loan – which had stood at almost 10 per cent a year ago, and over 5 per cent only three months ago – closed yesterday at 1.35 per cent, having fallen dramatically as one of the last major legal barriers to the ESM was removed. When Ireland had issued its last three-month bills, the interest rate stood at 4.28 per cent. Email “Bond auction sees Ireland’s cost of borrowing fall dramatically”. Feedback on “Bond auction sees Ireland’s cost of borrowing fall dramatically”.